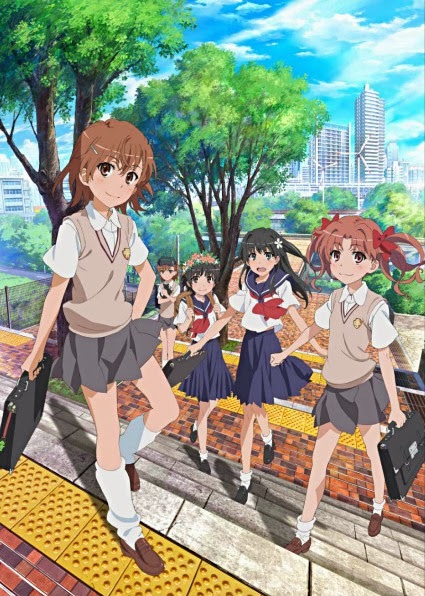 Posted on October 1, 2013 by Lena K.
The second season of the Railgun series is divided into 2 arcs. 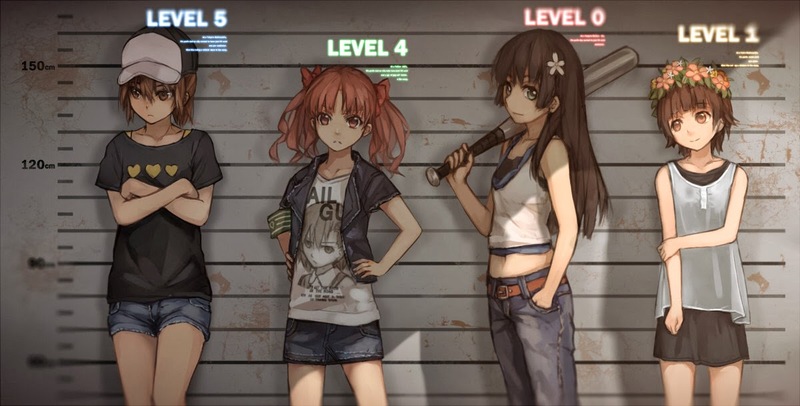 The first one focuses on the “Radio Noise Sisters”, clones of Misaka which are created in high number to fight against the strongest Level 5 esper, Accelerator and make him shift to Level 6. The second arc revolves around an underground organization that is fed up with the way espers get all the recognition while intellectuals like themselves are mostly ignored no matter how brilliant they are. To change the system they want to bring forth a revolution upon Academy City and of course Misaka and the gang get involved in this pretty quickly. Looking back on the first season, it felt very much like the main story didn’t really take in all that many episodes and the filler episodes or the “carefree fun” episodes how I like to call them, took in most of the first season. I thought it would be the same this time again, but I was wrong. Railgun S is full of action and epic fighting, which is great, especially since the animation made it all look so stunning. But then again, I was also missing the fun episodes a little since especially the first half of this season felt really gloomy at times. Nonetheless this atmosphere really helped to make Misaka stand out. I mean 90% of this anime, she is a total badass, desperately fighting for the sake of others, making the impossible happen more than just once. And alongside all the fighting, there’s also a little life lesson hidden. So while Misaka was only fighting alone almost the entire time in the first act, she more than once encountered a dead end and could only keep going because someone else helped her out. So in the second arc, she finally did the right thing and asked for help, instead of only relying on her own powers. This simple action saved her form so much more despair and things processed so much easier, that the lesson here is pretty obvious. And just to leave some words about the ending as well; I think it was maybe a little too much. Everyone was involved (well except for Touma which I thought was pretty good anyway), everyone had a special role in it, a hell lot of fighting was going on, Misaka was being a badass again, there was an intense speech, tears were involved and of course there was a happy end because Misaka and Kuroko managed to save Gakuen City… again. I think these are all themes that make the end of an anime absolutely awesome and don’t get me wrong, Railgun was awesome, it just felt a little overwhelming in the end and everything played out so well, that I didn’t feel as thrilled as I wanted it to feel like. Just like in the first season, what makes this anime so absolutely enjoyable is neither the great animation, nor the outstanding action sequences, it’s simply the characters, be it the good or the bad ones. I really loved them all. So this time it’s not just Misaka and her 3 friends anymore, it’s now Misaka + 99% of Academy City. Ok I’m exaggerating, but there are really a lot of important characters in this one, but all of them are somehow great! We get to know the “Sisters” a little better, we see yet another crazy side of Accelerator, Touma makes a bigger guest appearance and there are tons of new characters on either the good and the bad side. Let’s take Febri for example. She is like the personification of cuteness and probably the most adorable character in this anime that is already full of adorable stuff. However, Febri was so cute that it at times even annoyed me and I didn’t think that this was even possible. What I also loved in this season is the fact that the bad guys are not just one-dimensional evil characters that want to destroy the world, well not all of them at least. But let’s take the “Meltdowner Gang” for example. They are in general absolutely interesting characters and totally entertaining to watch as well. In fact, I liked them so much, that I would love to see “A certain pissed off Meltdowner” or something like that in the future. And if we now take into account that many of the villains in Railgun are not always fully on the evil side and even tend to help the good guys out at times as well, it just makes it all even more interesting! When it comes to the characters, there’s just one thing that really bothered me. In the very first episode they introduced a new character, Misaki Shokuhou, Tokiwadai’s other level 5 esper who seemed to be not all that friendly with Misaka. Her power looks interesting and also very hard to deal with for Misaka, but surprisingly even though it seemed like she would take in the role of one of the main villains in this season, she never appeared again… Well she had a small appearance in the last episode but for the most part, her introduction in the first episode was totally meaningless and misleading. Well maybe that just means that there is even more room for another season. I would be totally up for that! Oh and there was Nunotaba, who had a fetish of randomly using Engirsh words whenever there was the chance to do so. That was seriously weird but entertaining nonetheless. One of the greatest aspects of this anime is definitely its animation. It’s almost flawless, fluid and all the fighting scenes look so freaking great! Seriously there is so much epic fighting going on in this one, but all of it, without exception looks stunning to the point I sometimes even lost track of time while following the actions. What a surprise, both openings are yet again preformed by fripSide and of course that’s also why both of them are awesome because fripSide is awesome! The background music in the anime itself was also pretty nice and sometimes even epic, especially during the fighting scenes. It sometimes really gave me goosebumps. The yuri was… less than in the first season but it was there. Thanks for that, Kuroko. But since we didn’t get so many carefree filler episodes in this one, the amount of yuri was also shortened quite a bit since there was probably not enough space to put it in anyway. Nonetheless, Kuroko had some glorious moments with Misaka again and of course Saten was after Uiharu’s pants whenever there was the chance to do so. So don’t watch this show expecting a similar amount of yuri than in the first season, but either way, the few yuri moments we got were pretty nice. And now I think I don’t only want another season called “A certain pissed off Meltdowner” but also “A certain Pervy Kuroko”, now how does that sound? I loved the characters, I loved the animation, I loved the music and in general I loved this whole anime and I’m hoping for another season of this so much! 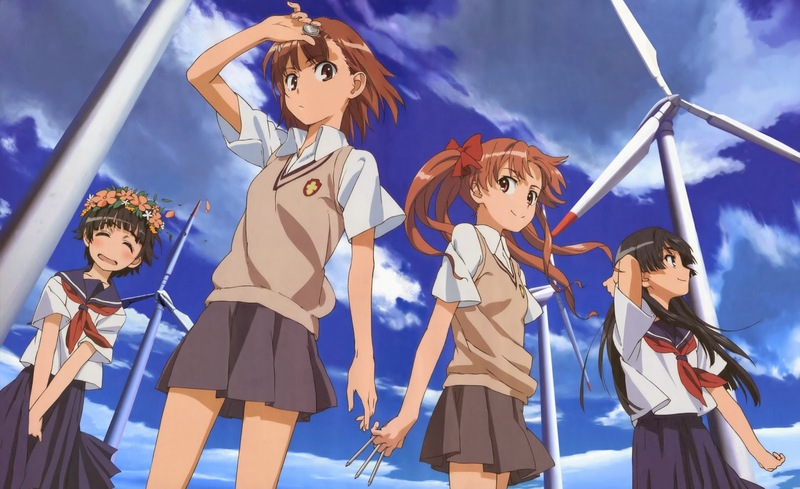 This entry was posted in Anime, Anime Review and tagged Toaru Kagaku no Railgun by Lena K.. Bookmark the permalink. So many 20+ episode anime in my leftover bin. I can't decide which one to watch first. I know Railgun will deliver. Too bad Saten and Uiharu don't get to flirt with each other. At least Kuroko got some moments from what you've explained. I'll happily finish the second season when I get the chance. I totally loved this new season! Oh and I'm finally watching Index II, which is pretty awesome as well. Hopefully they'll introduce some other Level 5 characters soon too. I have yet to finish the first season of Index. Haha yeah Touma and his Harem is probably not really the best thing when you're a yuri fan, but in his case I don't hate it as much as I usually hate themes like this. Especially Kuroko vs Awaki was awesome! I only started watching the movie, but never really finished it, so I don't really know. I think I'd prefer another Railgun season simply because I like the main characters of this one the most.